Offensive lineman Najee Toran talks about watching Hurricane Harvey devastate his hometown of Houston, how he checks in with his family every day and how he tries to stay focused on Sunday’s game. — UCLA broke away from the way its two-by-two quarterback rotation for the first time this spring, but it still didn’t technically eliminate anyone from the race. Instead, Jerry Neuheisel, Josh Rosen, Asiantii Woulard and Mike Fafaul each got a turn running the first-team offense in 11-on-11 scrimmages. No one in the group really had a bad day, but again, Rosen stood out. His feel in the pocket has been excellent through spring, and he looks particularly impressive rolling out to his right and throwing downfield. On one such play, he connected with running back Roosevelt Davis about 30 yards down the sideline. He also made a great throw to Thomas Duarte, squeezing the ball through a tight window on a play in which the receiver didn’t really look open until he actually made the catch. The timing of some of the plays counted for something too. Rosen was able to get the offense out of third-and-long on his first series, after the offensive line backed him up with back-to-back false starts. There was a healthy crowd out watching from parking lot 8 today, and broke into applause more than once. 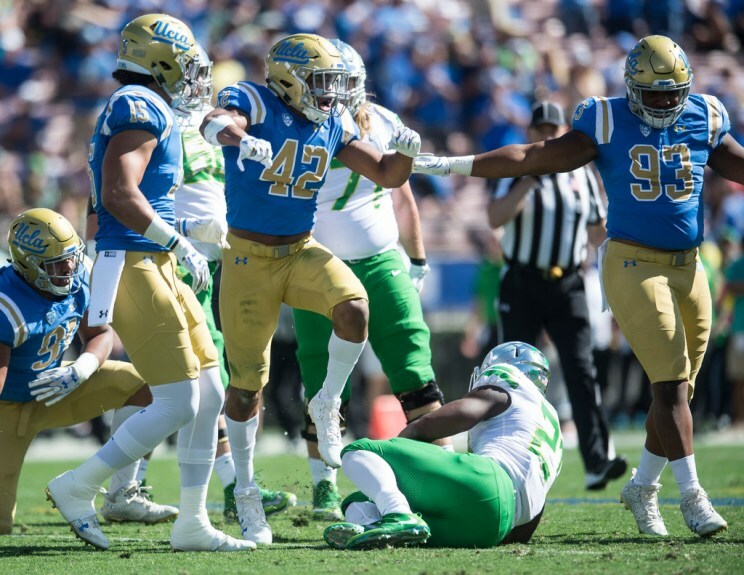 NaJee Toran and Aaron Sharp are two Bruins trying out new positions this spring, but the trend isn’t new for UCLA football.